Named By: C. C. Young - 1954. Classification: Chordata, Rreptilia, Dinosauria, Saurischia, Sauropodomorpha, Sauropoda, Mamenchisauridae. Species: M. constructus (type), M. anyuensis, M. hochuanensis, M. jingyanensis, M. sinocanadorum, M. youngi. 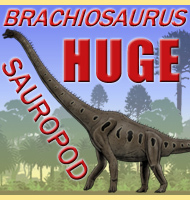 Size: Up to 35 meters long for the largest species M. sinocanadorum. Time period: Oxfordian to Tithonian of the Jurassic. Fossil representation: Several individuals are known, although usually from partial remains. 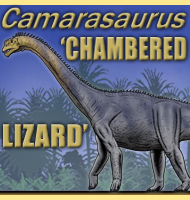 Although sauropods are known for having long necks, Mamenchisaurus was one of the few that took it to the extreme. With nineteen vertebrae, the neck of Mamenchisaurus was just as long its body and tail combined. 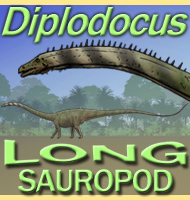 Such a long neck is thought to have been to enable Mamenchisaurus to sweep its neck across a wide area of vegetation without having to physically walk to constantly find new areas. This means that once Mamenchisaurus arrived at a suitable location it could quite possibly be able to feed for several hours without having to expend unnecessary energy. A discovery of another Mamenchisaurus in 2001 allowed for more accurate reconstructions of this dinosaur, one part of which was the tip of the tail where the vertebra was more robust with taller neural spines. 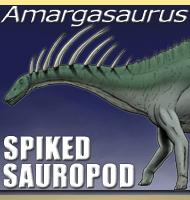 Current thinking for this construction is that the tip of the tail was modified to be a weapon as seen in some other Asian sauropods like Shunosaurus. 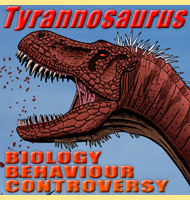 Such a weapon may have been used in dominance competition between two males, although it is not inconceivable that it could have been turned against an attacking predator. - On a new sauropod from Yiping, Szechuan, China. - Acta Paleontologica Sinica 2(4):355-369 - C. -C. Young - 1954. 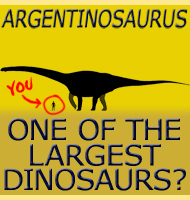 - [Mamenchisaurus hochuanensis sp. nov.]. - Institute of Vertebrate Palaeontology and Palaeoanthropology Monographs, Series A 8:1-30. - C.-C. Young & H. C. Chao - 1972. 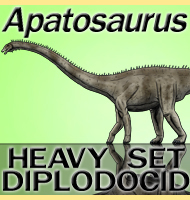 - [New discovery of sauropod dinosaurs from Sichuan]. - Vertebrata PalAsiatica 14(3):160-165. - L.-H. Hou, S.-W. Zhou, and S.-C. Chao - 1976. - A large mamenchisaurid from the Junggar Basin, xinjiang, People Republic of China. - Canadian Journal of Earth Sciences, (30): 2082-2095. - D. A. Russel & Z. Zheng - 1993. - A large mamenchisaurid from the Junggar Basin, Xinjiang, People's Republic of China. - Canadian Journal of Earth Sciences 30(10-11):2082-2095. - D. A. Russell & Z. Zheng - 1994. 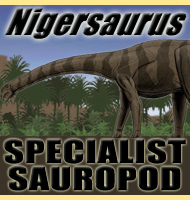 - [A new species of sauropod, Mamenchisaurus anyuensis sp. nov.]. - Papers on Geosciences Contributed to the 30th International Geological Congress 83-86. - X. He, S. Yang, K. Cai, K. Li, and Z. Liu - 1996. 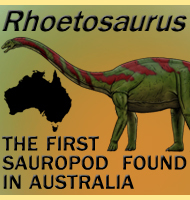 - A new species of sauropod from the Late Jurassic of the Sichuan Basin (Mamenchisaurus jingyanensis sp. nov.). - Journal of the Chengdu University of Technology 25 (1): 61–68. - Yihong Zhang, Kui Li & Qinghua Zeng - 1998. - New material of Mamenchisaurus hochuanensis from Ziging China. - Vertrebrate Palasiatica 39 (4): 266–271. - Y. Ye, H. Ouyang & Q. -M. Fu - 2001. - The First Mamenchisaurian Skeleton with Complete Skull: Mamenchisaurus youngi (in Chinese with English summary). -- 111 pp + 20 plates. Sichuan Science and Technology Press, Chengdu. - H. Ouyang & Y. Ye - 2002. 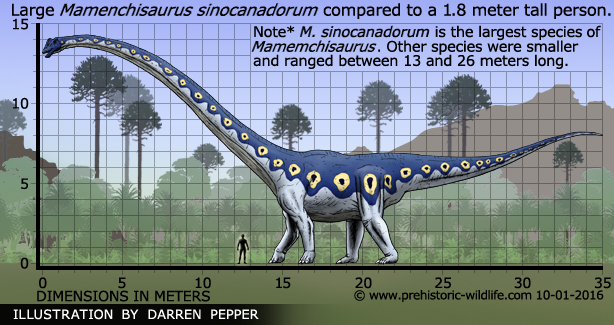 - Discovery of Late Jurassic Mamenchisaurus in Yunnan, southwestern China". Geological Bulletin of China 23 (9-10): 1005–1011. - Fang Xiaosi; Zhao Xijin; Lu Liwu; Cheng Zhengwu - 2004. - Structure, orientation and finite element analysis of the tail club of Mamenchisaurus hochuanensis. - Acta Geologica Sinica (English Edition) 83 (6): 1031–1040. - L. Xing, Y. Ye, C. Shu, G. Peng & H. You - 2009.